For a perfect balance of softness and durability, the geometric Hestia Natural Fiber Rug brings high style and quality into your home design. Bold patterned rugs, like this black and ivory one, help add depth and texture to the look of your living room, dining room or bedroom. 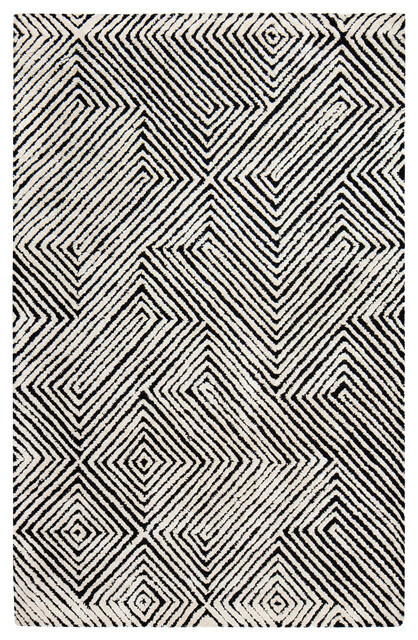 This unique rug's simple design, inspired by tribal patterns, can provide an easy facelift to your existing decor while its soft, medium pile provides a plush feeling underfoot. Sturdy backing also keeps your rug in place, making it a practical choice for almost any space. Enjoy the handmade look and feel of this rug, which was hand-tufted by skilled weavers using traditional techniques. This rug is GoodWeave-certified, which means you're not only making the world more beautiful by buying an artisanal product, you're making the world better by helping to end child labor and supporting fair working conditions. Jute fibers have anti-static, insulating and moisture-regulating properties to make your room naturally more comfortable. We recommend a rug pad to help your rug stay in place and last longer. Vacuum as needed using suction only; using a beater brush or beater bar may cause the rug to fray. For liquid spills, blot — do not rub — with a dry, undyed absorbent cloth. You may then try to spot clean with a damp, clean, undyed cloth. We recommend using a solution of mild dish soap and water and testing the solution first in a small, inconspicuous area of the rug to be sure no discoloration occurs. For solid stains, use the dull edge of a knife to scrape the solid up as much as possible and then follow the instructions for liquid spills. All fibers that are exposed to direct, prolonged sunlight will experience some degree of fading. If your rug is in a sunny location, be sure to rotate it regularly. W 96" / D 120" / H 0.5" / 72 lb.